In the 16 months between Connie Dabate’s murder and her husband’s arrest, Richard Dabate emptied his wife’s bank accounts, cashed in multiple retirement accounts and was on the verge of selling a home the couple owned in Vernon. The sale of that home on Talcott Road for $149,000 was supposed to close on April 21, 2017, a week after Richard Dabate was charged with murder. But an attorney for Connie Dabate’s estate asked a probate judge to halt the sale and Judge O. James Purnell III ordered a freeze on any of Connie Dabate’s assets, including that home, the day before it was supposed to close. The couple also owned a home in Ellington, where Connie Dabate was killed. Records show that while the sale of the Vernon house was halted Richard Dabate took hundreds of thousands of dollars out of his wife’s 401(k) accounts of which he was the beneficiary — at least one a Fidelity account worth nearly $100,000. He also took $70,292 from bank accounts in Connie Dabate’s name. Connie Dabate’s estate was the subject of a hearing Tuesday before Purnell, who scheduled it to get more information on why the estate was down to only $6.42. Richard Dabate started within weeks of his wife’s death by writing a letter to Protective Life Insurance trying to get them to pay him Connie Dabate’s $495,000 life insurance policy. She had taken out the policy in 2003, before the couple had any children, and named Richard as the sole beneficiary. “I’ve included what I hope is all the correct information to process my wife’s claim,” Dabate wrote. The insurance company denied his claim after state police detectives informed them he was a suspect in his wife’s murder. The company has since filed a federal lawsuit asking the court to take control of the money and determine who it should eventually be distributed to. A new inventory was filed by Dabate’s probate attorney Tuesday showing Connie Dabate’s estate was worth about $86,000. Richard Dabate, as executor of the estate, paid about $17,000 in funeral expenses and state and local taxes from his wife’s estate, records show. He then withdrew another $70,000 for himself before he was arrested and charged with his wife’s murder in April of 2017. That left the estate with $6.42. It is unclear what Dabate did with the $70,000. Lawyer John G. Tunila said he plans to file a motion asking Purnell to order Richard Dabate to pay back the $70,000 to the estate. Tunila represents Connie Dabate’s sister, who is now executor. “We want the money restored to the estate because [the estate] doesn’t have enough left to pay its bills,” Tunila said. Purnell accepted the new accounting of Connie Dabate’s assets and said he’d take up the motion to pay back the estate when it was formally filed. Purnell removed Richard Dabate as executor of his wife's will in May after Dabate was charged with murder in Connie Dabate's death. He appointed Connie’s sister as executor, froze the estate and ordered a full inventory. Connie Dabate, 39 at the time of her death, left all of her assets to her husband. The will was finalized before either of her two boys, now ages 9 and 6, were born and was never updated. Richard Dabate is free on $1 million bail. When Purnell removed Dabate, he ordered him to produce a full accounting of his wife's estate within two months but he hadn’t done so until Tuesday. In his initial report to the court Dabate didn't submit any information about why, in January 2016, he withdrew more than $90,000 from a Fidelity investment account that belonged to his wife, as outlined in his arrest warrant affidavit. Tunila said the Fidelity account was one of “multiple” 401(k)s that Connie Dabate had that Richard Dabate withdrew from following her murder. He declined to say how much money was in those accounts. The house at 7 Birchview Rd. in Ellington has been appraised at about $392,000, according to assessor's records. Connie Dabate was found shot in the back of the head in the basement of the couple's Ellington home. Richard Dabate told state police that his wife was killed by a masked intruder who shot her in the couple's basement after chasing her. He told police he fought with the man in the second-floor bedroom before he was subdued by the intruder. Richard Dabate was found by police sprawled out in the kitchen of the couple's large, colonial-style home. One of his arms and a leg were secured to a folding chair with a zip tie, and he had superficial knife wounds. Dabate told police he escaped by knocking a blow torch into the intruder's face with his free hand. 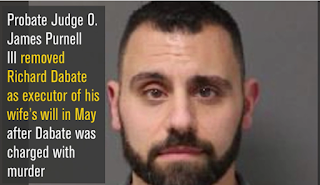 Dabate eventually told state police in a six-hour interview that he had a pregnant girlfriend and that his wife was going to help "co-parent" the baby. He later acknowledged that the pregnancy wasn't planned. He promised his girlfriend that he was getting a divorce, according to the arrest affidavit. The baby was born in February of last year. State police obtained cellphone records for the couple, computer records from Richard Dabate's laptop, Facebook records for both of them and the girlfriend, text messages and Fitbit records for Connie Dabate. Connie Dabate's Fitbit showed her last movements were at 10:05 the morning she died, nearly an hour after Richard Dabate told police she had been killed. Facebook records showed Connie Dabate posted three videos at 9:46 a.m., and the alarm system records showed movements throughout the house that didn't match Richard Dabate's description of the attack, the warrant showed. Connie Dabate also had a $475,000 life insurance policy that Richard Dabate tried to claim five days after the murder, only to be rebuked by the insurance company. The insurance policy isn't required to be listed as an asset of her estate. Purnell said that the case will proceed through probate court but that a final distribution of assets will not be approved until Dabate's criminal case is resolved. Purnell said any sales of property or other assets will be held by a court-appointed fiduciary, and all assets of Connie Dabate will be frozen.